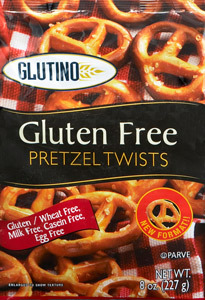 This brand was the first brand of gluten-free pretzel that I found. Because I was a huge pretzel fan I was really happy to have an alternative but there were several unusual things about this pretzel that I wish I could change. My product review is for their plain pretzels. Recently these have come in flavors – sesame, chocolate covered and yogurt covered – I have not tried these. I am rating it ♥♥ with a score of 12 out of 20. In all fairness, if I could take the price scores out of this, it would end up being 3 hearts but because this product is so expensive, it reduced its overall rating. Appearance/size: These pretzels come in two different sizes, sticks and mini-twists. They look good although the mini-twists seems to be smaller in size than a regular mini-twist pretzel. They also look a bit lighter and at a glance appear to be soft. Flavor: These pretzels have an odd flavor at first with a definite aftertaste. They took me quite a while to get used to. I was never able to pass these pretzels off at a gathering as “regular” pretzels. A year and a half ago, there was only one other pretzel option that I could find by me (Ener-G) so instead of going without I “got used to” the flavor of these. Texture: While they are firm, they are not really crunchy or crisp. They hold up very well to any dip you wanted to use them for. But tended to be a bit chewy. Again for me, something I got used to because I did not have options. Price: These pretzels are EXPENSIVE. For the longest time the only size that was available (in my area) was the family size (about 14 oz I think) and I paid between $6.99 and $8.99 for them. Wowsa. Cut back on my pretzel addiction really quick! Over all, this would be my second choice in pretzels. The taste will take some getting used to and in my opinion do not look or taste like the ones I was “used to”. For the price, for me, I often chose chips instead of these particular pretzels. 😦 My suggestion to you would be to check out my review for my favorite pretzel – Snyders of Hanover – Gluten Free Pretzels and see if you can find them instead. Next Post OK, So I know I Can’t Have Regular Flour….What Should I Use?